Like Tuesdays, Monday nights at SXSW aren’t usually that busy. Generally, there’s a dearth of showcases. 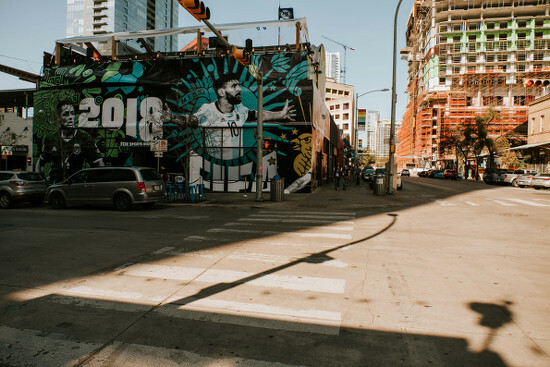 At SXSW 2018, there was plenty for me to see and plenty of acts for me to tick off my list, which was great news. 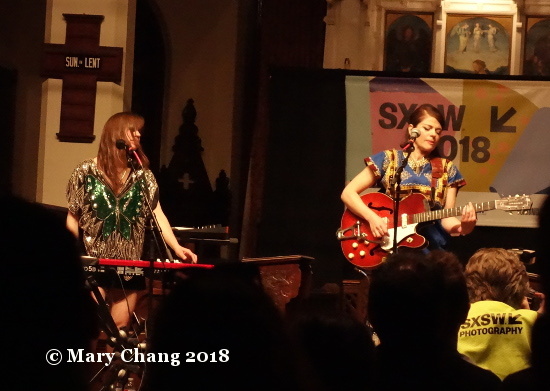 English singer/songwriter Gemma Ray, who now calls Berlin home, opened the evening at St. David’s Historic Sanctuary. Resplendent in bright yellow and blue, Ray conjured up a blend of country, folk and blues with her backing band of a keyboardist and drummer. It’s too bad that the early start of her set meant she played only to a half-full room. 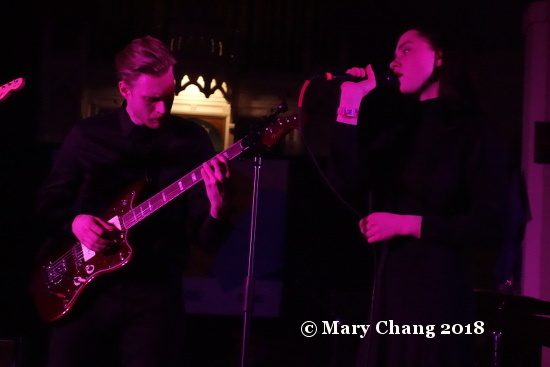 Holy Motors from Estonia were up next at St. David’s. 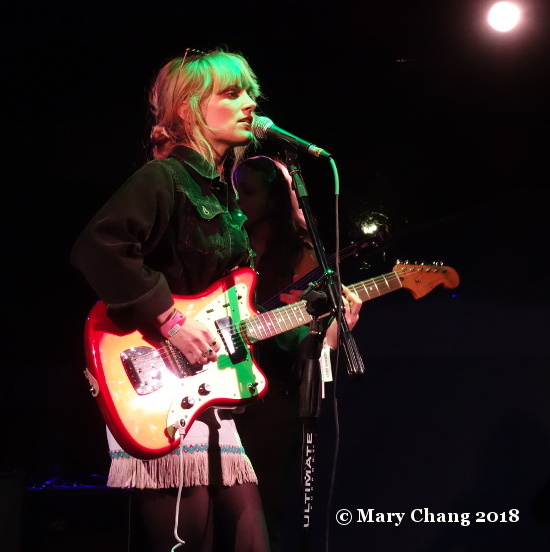 As one of my tips for SXSW 2018, the five member strong, female-fronted group from Tallinn captured my ears, along with those of domestic SiriusXM Alt Nation station DJs. The sound of Eliann Tulve’s intonings, along with her bandmates’ droning guitars, made for a mesmerising sound. At times, the lack of movement from the guitarists, except of course to strum the strings on their instruments, made it seem they themselves were self-hypnotised to their songs. Holy Motors’ sound is beautiful, indeed, but they’re a less than exciting proposition live. To inject a bit more liveliness into my evening, I headed down to 6th Street, specifically to B.D. Riley’s, for some Americans’ antics. Orange County long-haired rockers The Jacks had already begun a hair-raising set, the punters assembled for them down close to the stage and excited to hear them knock out song after song. 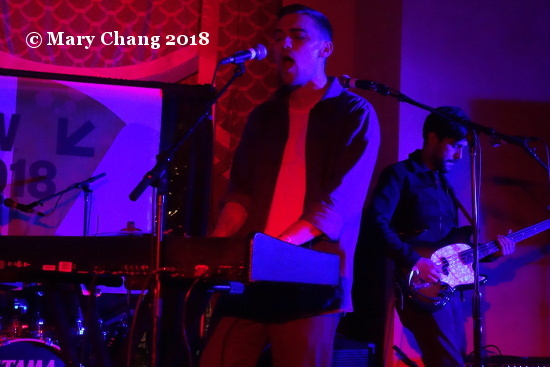 Although a friend commented to me that they sounded and looked like every other band from Orange County, after Holy Motors’ set, their raucous rock was like a welcome splash of cold water to the face. They were only in town for 2 nights, stopping through Austin during their tour of Texas. Having been brought back to life by The Jacks, I bounded over to nearby Latitude 30 for a visit to the BBC Introducing / PRS Foundation-sponsored showcase at the British Music Embassy. I had some good fortune to catch one of only two evening appearances by Jerry Williams (pictured at top), whose name sounds like a country and western artist. In actuality, she’s an up-and-coming young singer/songwriter from Portsmouth. Unsigned as of the time she embarked to her trip to Austin, her (dare I say it) young girl adorable, bouncy voice and poppy tunes probably hit the spot to more than a few A&Rs in the audience. Following Williams was another talented up-and-coming female artist, Swansea’s Rachel K Collier. Like Williams, she has been self-releasing and -producing her own music, part of the growing cabal of strong young women showing the boys, not to mention the industry, that they know what they’re doing, can do it all by themselves and with incredible results. Electronic has notoriously been a difficult genre for women to break through in. Collier’s smarts in creating seriously catchy beats and melodies, while also inserting her personal touch with lyrics about her own life and experiences, has translated to dance music that connects to both dance and electronic fans, along with those who want more. Stepping occasionally from behind her electronics and into centre stage at the venue to sing and pogo along with the audience, the Welsh talent proved she can put on an exciting stage show. Stay tuned for an exclusive interview with Collier conducted in Austin soon here on TGTF. I stayed put at the British Music Embassy for a brief taste of highly hyped, 2018 NME Under the Radar Award winners Manchester band Pale Waves, who Carrie previewed back in January. While I knew they were tour and label mates with the massively popular, and SXSW 2013 alumni The 1975, I didn’t realise how closely their pop/rock songs mimicked those of their Manchester friends. 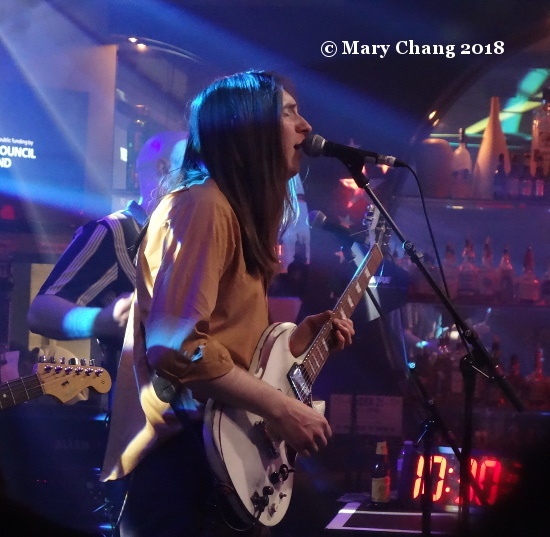 Whereas Rachel K Collier and her percussionist Rhii brought bright colours to Latitude 30, Pale Waves turned things decidedly monochrome, frontwoman Heather Baron-Gracie favouring checkerboard trousers, making me think of another SXSW showcasing band, The Specials. Her thick eyeliner was reminiscent of one her biggest band influence, Robert Smith and The Cure. Carrie and I crossed paths at the Victorian Room at the Driskill Hotel, her catching Manchester’s Chloe Foy and Scot Colin Macleod before I arrived. I hung around during what seemed a particularly long soundcheck for Oxfordshire’s Rhys Lewis (see my preview feature on him here). He and his band were having trouble with multiple devices, including the pedal to his piano. Maybe he would have been better off with an acoustic set like this one filmed by the BBC on 6th Street? 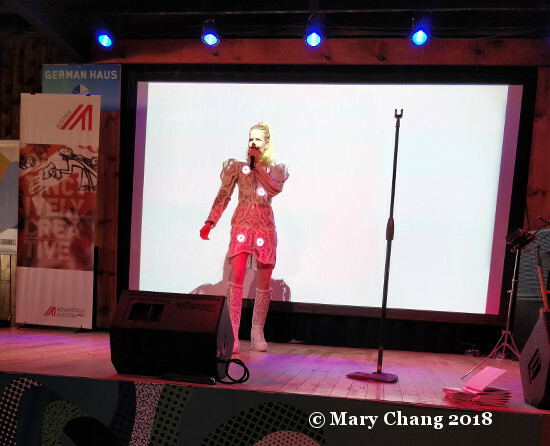 I haven’t spent much time in the performance space in the historic hotel over the years I’ve done SXSW and this year, I felt this niggling discomfort in the room while I waited. While his vocals on recent single ‘Bloodstains’ and ode to London ‘Living in the City’ sounded great, the venue just didn’t seem quite right for the singer/songwriter, as punters sat cross-legged in front of him, giving the performance a primary school feel and not one of being at SXSW. 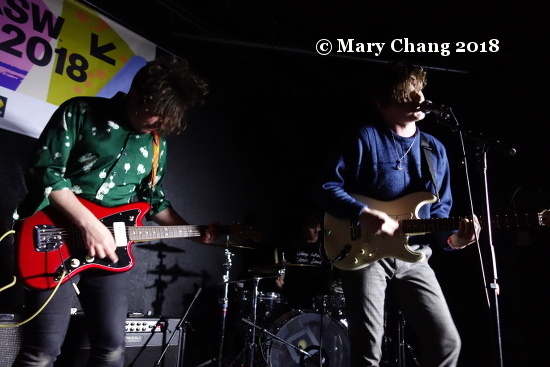 My final band of Tuesday night were Mullingar’s The Academic, who both Carrie and I covered at SXSW 2017. 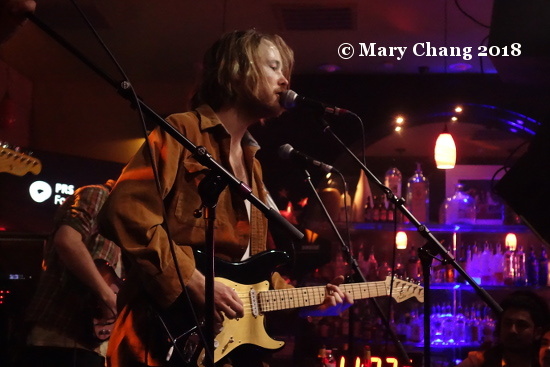 Having just finished their first major North American tour, the Irish pop/rock group were able to fit in this special performance at The Main II, a return to Austin to cap off their time in our country. At the start of this year, they released their debut album ‘Tales from the Backseat’, a collection of fun, toe-tapping tunes. Read my review of the LP through here. They played an unusually long set by SXSW standards; I was half-expecting the light to be switched on and for them to get the hook at some point, but venue staff let them keep going. The crowd was a mix of fans who had the album and people who had never heard of them. It’s unclear where the locally-based Irish students fit in this spectrum, but as several of my Irish musician friends have repeated to me, “if an Irish band is playing, we all come out and show our support”. Hooting and hollering ensued during and between songs, including singles ‘Bear Claws’ and ‘Why Can’t We Be Friends?’ They ended their set with an amazing cover of ‘Linger’ by the Cranberries. I got chills as all of us in the venue sang along with the and with gusto. While they didn’t explicitly say so, I’m sure the decision to include it was a loving tribute to the late Dolores O’Riordan who died unexpectedly in January. Theirs was a wonderful, well-formed set that showed maturity, the result of plain ol’ hard work in this often fickle business. It was hard to believe this was the same band I saw at the Music from Ireland showcase last year. Upwards and onwards! For more photos from my Tuesday night at SXSW 2018, go here. We woke up at an ungodly hour – for SXSW, anyway! – to move into a downtown hotel and to catch the Output Belfast boat showcase, which you’ll hear about from Carrie soon. Following our good time watching Irish talent while going down the Colorado River and back, Carrie was off to the convention center, while my destination was Barracuda, home of German Haus for the week. In past years, I’ve given this place a pass. In the first few years I came out to Austin, I wasn’t even allowed in, as German Haus is badges only. Okay, so I was pretty bummed out when I didn’t have access. Now as badge-carrying press who can go in, I totally get their badges-only policy. German Haus is unlike pretty much any other houses and venues across Austin during SXSW. Your favourite alcoholic drinks were available at the bar if you wanted to buy them but the people who brought us Oktoberfest weren’t in Austin to throw free booze at us. Therefore, there is no reason for them to welcome those in Austin who are only there to party. There was a complimentary Viennese Coffee House pop-up bar on Tuesday to keep the rest of us caffeinated and present for their interesting conference panels. I don’t drink coffee, so the fact that they also offered the most delicious hot chocolate during one of the coldest SXSWs I’ve experienced was priceless. It might sound strange and entirely un-rock ‘n’ roll that I am extolling the virtues of a hot beverage on an afternoon at a music festival. But believe me, when you are running around for days on little energy, think you’re going mad and often feel you might end up bawling because you’re exhausted, it’s the little moments of unexpected kindness and beauty that remind you why you’re here. Tuesday was the takeover of German Haus by Advantage Austria, so strewn over the networking tables were scratch and sniff brochures of the natural fragrances of Austria (no, really), samples of the legendary Sachertorte (sadly, I got there too late to have one) and an invitation to visit one of their famous cafés. Maybe the chocolate was going to my head, but I fell in love with Austria that afternoon. I’ll get there one day soon. 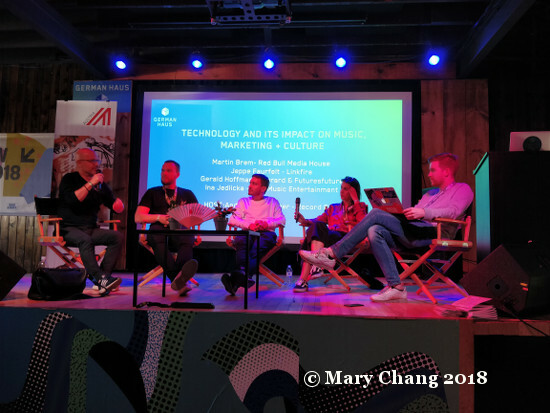 The session on Technology and Its Impact on Music, Marketing, and Culture was a positive one, starring panelists from Red Bull Media House, Linkfire and Columbia Records, as well as a successful musician. Martin Brem of Red Bull spoke of there being more money over the table than under the table, a sentiment that was echoed in other sessions I attended during the week. Gerald Hoffmann, aka Austrian rapper Gerard, offered up his unique perspective as an artist and how thinking outside of the box in terms of connecting with his fans. Specifically, he explained how letting them call his secondary mobile phone number and leave messages translated to them feeling like they have better connections with him, which in turn led them to buy his music in droves and give him more support. 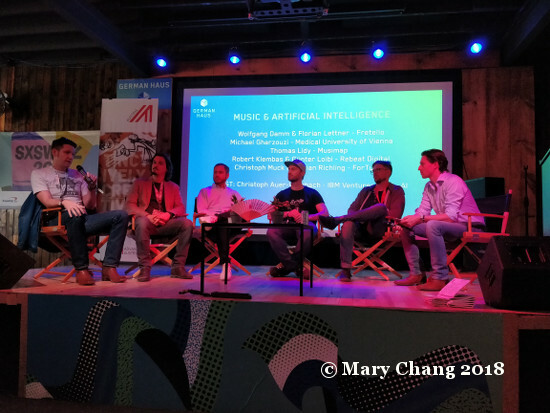 The session that followed, entitled Music and Artificial Intelligence, was one of many panels on AI offered across Austin during the week. While the fear of robots taking over our lives seems very real to many, the panelists were quick to dispel any worry that robots and computers were here to replace real live musicians. Gunter Loibl of worldwide music distribution company REBEAT Digital made the best statement of the panel: “It won’t be fun to sign an algorithm as an artist.” As handy as computers might be to create what could sound like a hit single, computers won’t be able to duplicate the personality, the charisma and certainly the spontaneity of a human being. So our musician friends will be in good shape for years to come, I reckon. If anything, as technologies progress, it will make music making easier and dare I say it, more fun, too, as evidenced by this female drummer who wore this amazing lace dress with tactile beat buttons on it. Want to wear a sequencer to your next party? It looks like you can do just that! It’s important to note that now that SXSW Conference badgeholders for the Film and Interactive conferences have secondary access to all Music showcases for a second year, they’re staying longer in Austin to make their time in town more worthwhile by checking out events from the other two festivals. This phenomenon, of course, impacts capacity at the music festival venues, making things more difficult for the wristband holders and anyone wishing to pay a cover to get into a venue. Carrie can speak to her opinion on this in her posts but for me, in general, the secondary access hasn’t affected me that badly, because the acts I tend to see are indie artists who aren’t on Americans’ radars yet. There is nothing better than seeing an act playing an entirely relaxed show to a handful of people, knowing they’re heading for greatness and you saw them first. 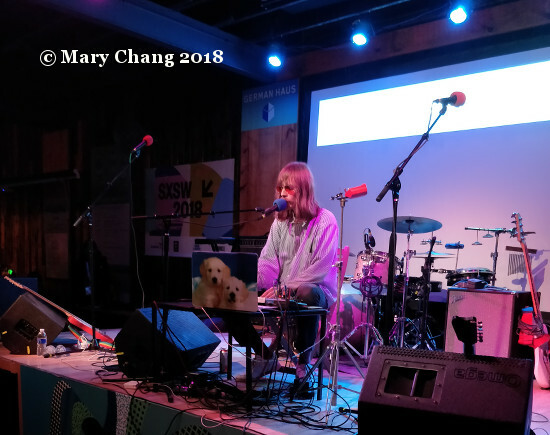 I’m noting it in this piece because as in past years, Monday night at SXSW 2018 was another relatively slow night showcase-wise. As a result, long lines seemed to be everywhere. I had great plans to stop into a few different showcases. Instead, I had to pare by my expectations, but I had some unexpected finds that made my evening pretty special. DIY Presents returned for a second year, this time bringing two bands who had appeared at Latitude 30 and four making their first visit to the venue, two of those that I saw. The evening there began with Scottish punks Breakfast Muff. Taking a quick look at the set list, I noted they had an awfully long list of songs. Then I considered for a band like theirs, their tunes were likely to be 2 minutes or less. I wasn’t wrong. They made quick work of the first 1/3 of their set, blasting out song after song with impressive ferocity. While virtually unknown prior to their coming out for SXSW, I’d expect the young band’s star to rise significantly upon the release of their next EP ‘Crocodile’ on the 6th of April. Once I’d had enough of Breakfast Muff, I headed to Barracuda, which has hosted the always reliable Monday night showcase starring German artists. On the indoor stage, World Brain opened the Hamburg X Berlin Music and Interactive Night on a wigged out, humorous note. World Brain is the solo project of long-haired, bespectacled Berlin-based Frenchman Lucas Ufo, who is also a member of Berlin group Fenster. The solo artist performed his brand of off-kilter, oddly catchy, bluesy alt-rock with a photograph of puppies sat in front of his laptop. To get a flavour of his music, watch this performance from Cologne last November. It doesn’t entirely do his music justice, though: he broke out a clarinet for one of the songs this night, an unexpected surprise. Just steps away, playing at the Barracuda backyard patio was Emma Elisabeth, a Berlin-based Swedish singer/songwriter, and her band. 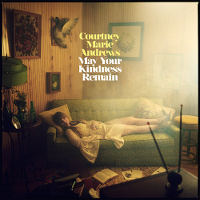 Her style is jangly guitar pop, drawing obvious comparisons to ‘80s band The Bangles and acts similar. While her sound isn’t earth-shattering, she has an enjoyable enough voice that I could see her music being picked up for use in syncs. Back over to the indoor stage, it was Fenster’s turn. Named after the German word for “window”, they are an experimental pop band who’ve been going for a good decade now and have appeared at SXSW before. With their unusual song structures and instruments beyond the usual suspects in rock bands, they provided the ears with something wonderfully different. I returned to Latitude 30, encountering my first major queue at SXSW 2018. 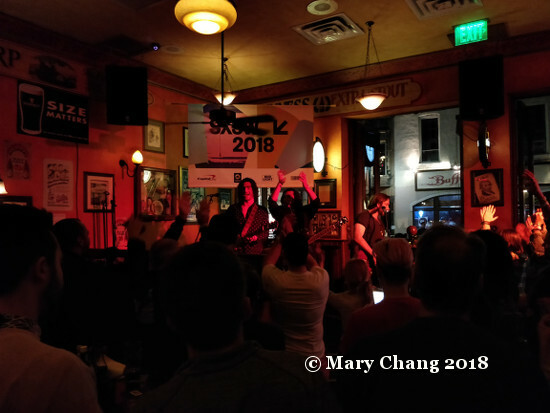 It’s with some irony that I couldn’t get in for Catholic Action, one of the four acts I wrote about in the Music Bloggers Guide to SXSW 2018. Even in a queue outside, once security decided to crack open the windows facing San Jacinto Boulevard, I could groove to their glam rock tunes. I finally made it in for the Glaswegians’ last few tunes. They ended their set with their clap-happy single ‘L.U.V’, which met with big cheers from the crowd. London-based Swedes Francobollo were up next. They sound more like an American band than a European one, their music focusses on big guitar chords and harmonies. 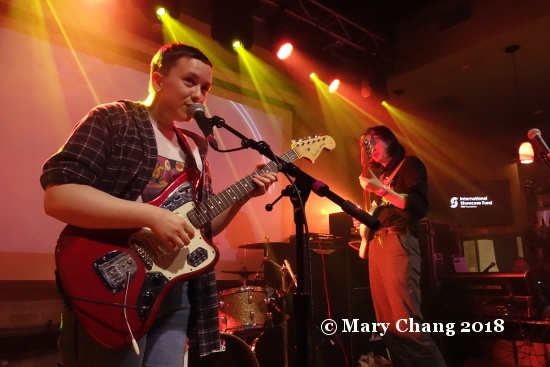 The booming nature of their grunge-y sound made them a good act to follow Catholic Action. We had an early morning on Tuesday, so I bid my first adieu to Latitude 30 for 2018. To see more photos from my Monday night at SXSW 2018, come through. Heading up to the fourth floor for sessions, I stopped in an overflow room to hear the second half of Mayor of London Sadiq Khan’s Convergence talk. Khan’s interviewer Lydia Polgreen of The Huffington Post seemed eager to hear about his controversial stance against worldwide rideshare giant Uber. (For those wondering about the context, Austin’s politicians also outlawed ridesharing companies for a time before ultimately reversing the decision.) Khan explained his position that he was for companies like Uber as long as they abided by the rules and played fair along with the rest of the London cab ecosystem. His comments on Uber mirrored his closing statements about Britain’s relationship with America. Likening it to a bond between best mates, he made the excellent point that the relationship between the two world powers should allow one to call out on the actions of the other. His measured way of speaking and approaching controversy is not at all surprising, given his background as a human rights solicitor prior to entering politics. But given that he is the first Muslim mayor of a major world city and is leading by example, the kind of person Khan is is all the more refreshing. Watch the entire keynote and follow-up q&a below. It seems every year there are more and more conference sessions on the world of food. The internationality of the foods we consume and the interest generated on how foods are made, by whom, its origins and even its photogenic qualities (thanks, Instagram) have turned chefs, restauranteurs and specialty food purveyors into global stars. 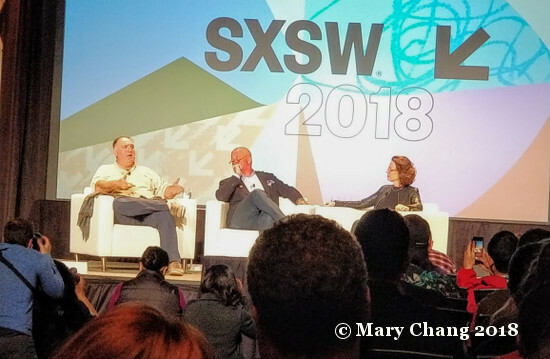 Chefs José Andrés and Andrew Zimmern were paired up in a session called ‘Changing the World Through Food’, moderated by former Food and Wine Editor-in-Chief Dana Cowin. Both Andrés and Zimmern come across on television as masters of their craft while also being affable, hilarious and down to earth individuals. Their appearance at this year’s SXSW Conference confirmed that, as they told anecdotes about their childhoods and travels. Andrés was viewed primarily as a local Washingtonian celebrity restauranteur until his humanitarian work feeding people in weather-ravaged Haiti and Puerto Rico raised his profile and rightly so. It’s a sad state of affairs that all the coordination of a chef and who he knows was better at feeding and helping the people in Puerto Rico who were without electricity than efforts by FEMA. Andres explained that growing up, his family didn’t have a whole lot of money or food, but he never went hungry. Both he and Zimmern agreed that the pervasiveness of childhood hunger, and within the context of food waste, is a red flag that we have failed as a first world country. While neither guest offered direct solutions to this, both contribute or are in heavily involved with anti-hunger organisations and charities. If there is one big benefit to society from the celebrity-ization of chefs, it is the chefs’ ability to raise aware the causes dear to their hearts and foodies will open their pocketbooks, just like music fans will when their favourite artists are also promoting charities. Zimmern’s tv show Bizarre Foods has highlighted the origin and popularity of food in far-flung places, bringing the world closer in to his viewers and helping them better appreciate the diversity and the artistry in the making of food. I agree with him that making food for someone and sharing your love through the medium of food is one of the most loving connections you can share with another human being. I caught up with the Austin episode of his new Travel Channel show The Zimmern List upon my return. Filmed last summer, he chats with local musicians at Stubb’s about the similarities between food and music, in particular the associated creative freedom. I see these parallels too: the making of an amazing dish, like writing an album, is the preparatory work before you hand your work over to a consumer. They might love or hate it. Regardless of how it’s received, you’re giving a part of yourself and that, in itself, is a loving gesture to another person. It may be hard to wrap your head around the idea that the guy who made that burrito behind the counter for you thinks what he’s just handed to you wrapped in paper is art. I get that. But if we stopped to think that the other person who has just given us something meant for it to be important, wouldn’t we put more value to it? And wouldn’t we all have more meaning to our lives? Watch the entire session with Andrés and Zimmern below.